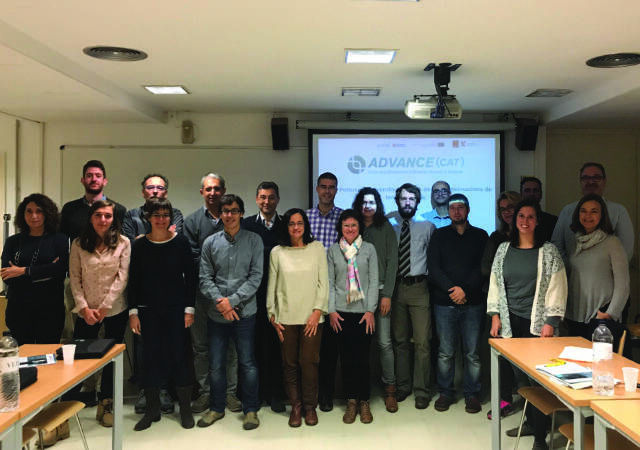 The BMF and the Centre of Regenerative Medicine in Barcelona (CMRB) presented results on cell therapy at the fourth work meeting of Advance(cat), which was held on 9 November at the Clínic Hospital in Barcelona. Ricardo Casaroli, the Scientific Director of the Barcelona Tissue Bank (BST), acted on behalf of the BMF and Dr Jordi Monés to explain the procedure for the study of cell therapy conducted on an animal model. The research team generated a model of geographic atrophy (GA, one of the latter stages of AMD) in the retina of a porcine model and this was then treated with RPE cells obtained from induced pluripotent stem cells (iPSC). Dr Casaroli highlighted the rigorous characterisation, both morphological and functional, to which the differentiated cells were subjected at the laboratories of the CMRB, prior to being used for the study. The aim of this cell therapy was to validate the implantation and survival of these cells in the affected retina. It was concluded from the results that there are indices of integration and survival of differentiated cells in non-atrophic areas but that their integration into the damaged retina could not be observed. However, these results will enable us to keep improving and researching new avenues for the application of cell therapy in the foreseeable future. Advance(cat) is funded by the Agency for Business Competitiveness (ACCIÓ) of the Government of Catalonia and the European Union through the ERDF (European Regional Development Fund) operative programme, Catalonia 2014-2020.